Welcome to Creative Visual Productions the studio covering all your multimedia needs for 24 years. 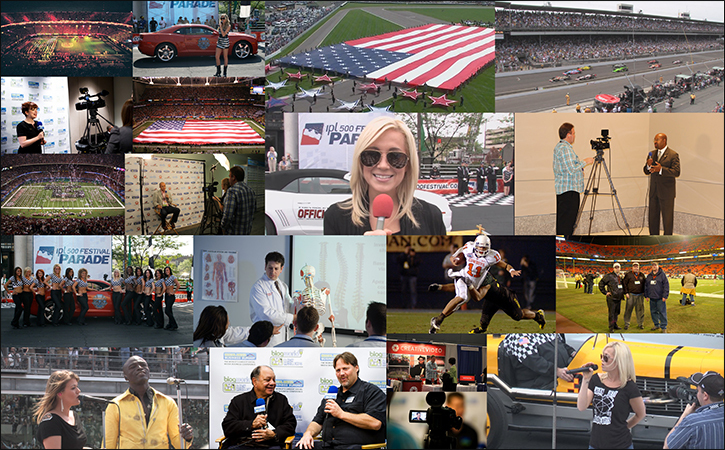 Our staff has experience working at all three major broadcast networks ABC, CBS and NBC. 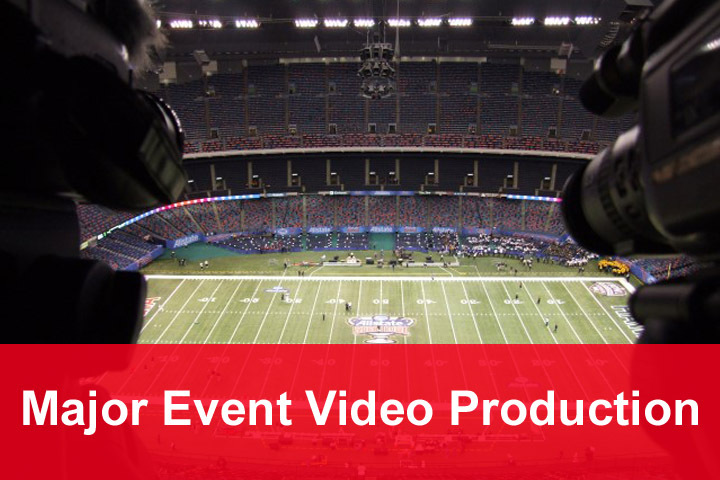 CVP has produced programs and DVDS for major corporate clients like Sony Music, IBM, FedEx Ground, The Allstate Sugar Bowl, United Way, The Indy 500, Discover Orange Bowl, Hollywood Christmas Parade, Blogworld and The BCS Championship Game have benefitted from Creative Visual Productions expertise and experience. For a major production or just a short thirty second explainer video, you are guaranteed a quality experience that will deliver your company great campaign results. CVP prides itself on offering affordable pricing while delivering quick high quality turnaround. CVP can deliver assets at all budget ranges starting at $500. Give us a call and we can discuss your project and find the right package for your budget needs. Actually speak to a live person, and if we just happen to all be on the phone, leave a message and we will call you back shortly. With our location in Woodbury, NJ, Creative Visual Productions has a green screen studio, eight edit suites, and a duplication department to handle any of your video replication or video transfer needs. 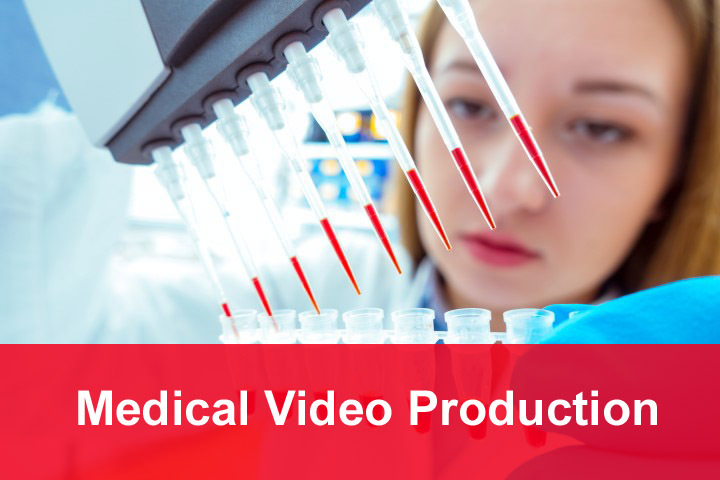 CVP’s production director has over thirty years of experience in major market TV, DVD production, and online video. From producing video for the late Michael Jackson’s greatest hits “History” album to twice setting up a studio for George Bush to practice for the presidential debates. Creative Visual Productions has professionally produced more per-edited-minute of footage for clients than any other facility on the east coast. 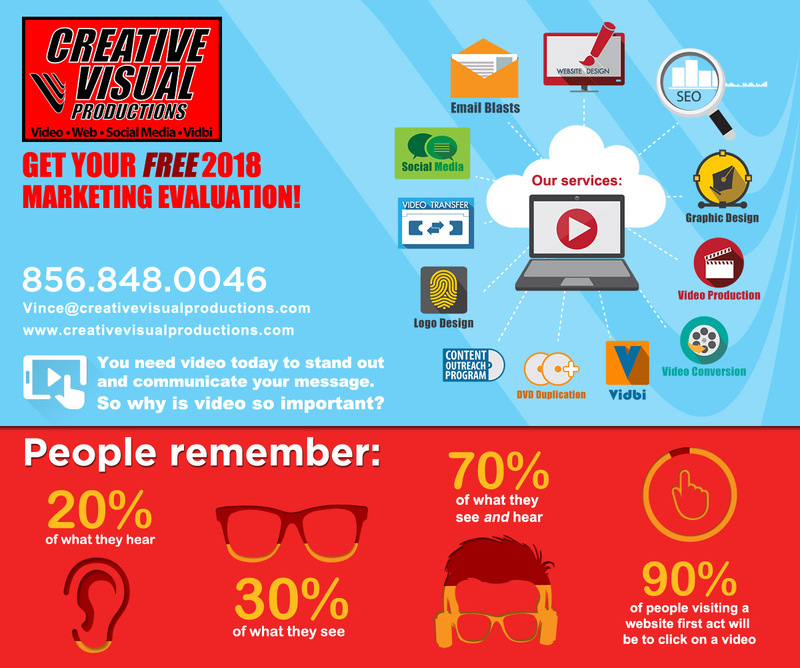 Creative Visual Productions has been leaders in high-quality video, DVD, blu-ray and online video production in Philadelphia and South Jersey since 1993. In today’s digital age, there are more applications for video than ever before. 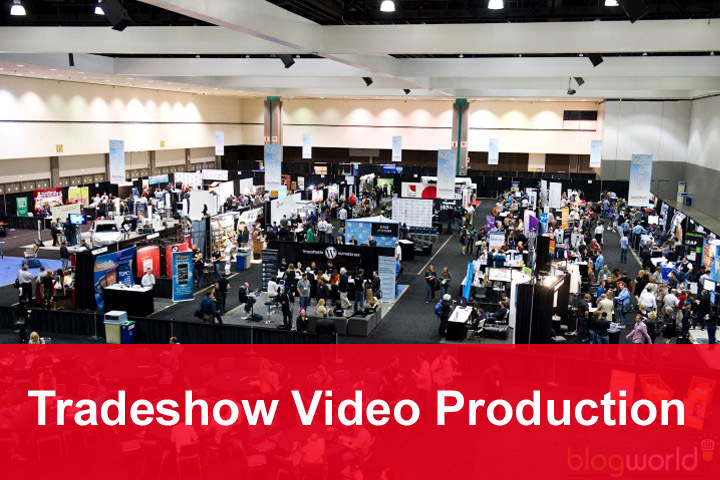 Whether you are aiming to create an amazing presentation for a tradeshow or an integrated social media strategy to engage your clients, Creative Visual Productions offers a full range of corporate video services that will allow us to make your ideas come to life. 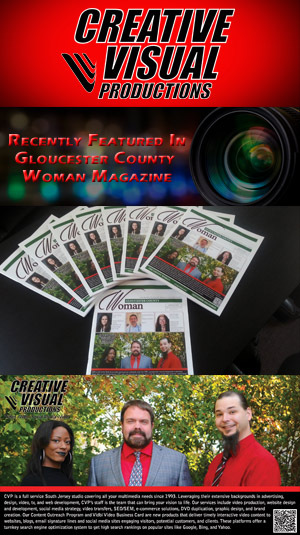 I highly recommend Creative Visual Productions as your Marketing Services Consultant of choice. I had the pleasure of working with Creative Visual Productions last year (2014) through the New Jersey Business Incubation Network (NJBIN) and currently as director of the Camden CoLab. Their work has had a tremendous impact on the NJBIN website; we went from only receiving a few referrals a year to receiving several a week. We would like to take this time to highly commend Creative Visual Productions for the marketing and advertising work they have performed for International Child Assault Prevention (ICAP) and its subsidiary, the New Jersey Child Assault Prevention ( NJ CAP) project, over the last twenty years. Their work with our organizations has really helped to communicate our message and build awareness of the programs we offer throughout the state, country and worldwide. For 20 years, Bowl Games of America and Sky’s The Limit Productions has utilized the services of Creative Visual Productions to capture the images of major sporting event productions we coordinate, reproduce them in mass for participants and provide online promotional services to help market and sell our services each year. If a ‘picture is worth a thousand words’, then our video experience with Creative Visual Productions has been worth a million. Creative Visual Productions provides forward thinking solutions to corporations that want to capitalize on new opportunities now available on the internet, social media, video, and mobile mediums. In today’s multimedia driven society more companies are realizing on a daily basis that they need a reliable firm with superior talent to supply them with state of the art digital services. We professionally edit using Grass Valley Edius, Adobe Premiere, and Adobe After Effects. By adding background music from one of our eight libraries, customized graphics, professional voiceovers, special effects, and titles, we raise your brand to a new level. Creative Visual Productions collaborative team approach to integrated communications can provide direction on how best to navigate the changing business landscape of advertising & marketing in this new digital revolution. Embracing change in your business with innovative dynamic video strategies can position your brand atop search engines like Google, YouTube, Bing, and Yahoo generating immediate ROI. Broadcasting your message via mobile marketing to smartphones with scheduling mechanisms and compelling time-based advertisements persuade the user to take immediate action. Utilizing the growing popularity of digital video through your website and social media like Facebook, Twitter, LinkedIn, YouTube, and Vidbi will engage and inform clients building loyalty to your brand. With visually stimulating production and targeted branding, Creative Visual Productions is the right choice your business can rely upon to give your project award winning creative services. 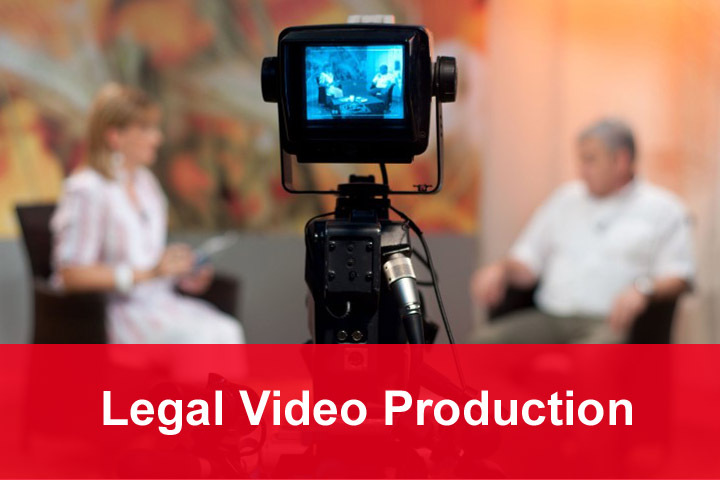 For over twenty-three years, Creative Visual Productions has been leaders in high-quality video, DVD, blu-ray and online video production in Philadelphia and South Jersey. Creative Visual Productions uses all HD video cameras and editing programs in their production process. Creative Visual Productions has been producing the highest caliber of video for national brands since 1993. Corporate clients such as Sony Music, IBM, Fedex Ground, The Allstate Sugar Bowl, United Way, The Indy 500, Discover Orange Bowl, Hollywood Christmas Parade, Blogworld & New Media Expo, CDI-IT Solutions, and The BCS Championship Game have benefited from Creative Visual Productions expertise and experience. In today’s digital age, there are more applications for video than ever before. Whether you are aiming to create an amazing presentation for a tradeshow or an integrated social media strategy to engage your clients. Creative Visual Productions offers a full range of corporate video services that will allow us to make your ideas come to life.